VeriCite DocumentationUser GuidesBlackBoard User Guide Admin ArticlesHow do I view VeriCite statistics as an admin? From the Admin menu, select Statistics. Zoom: From the Admin menu, select Statistics. 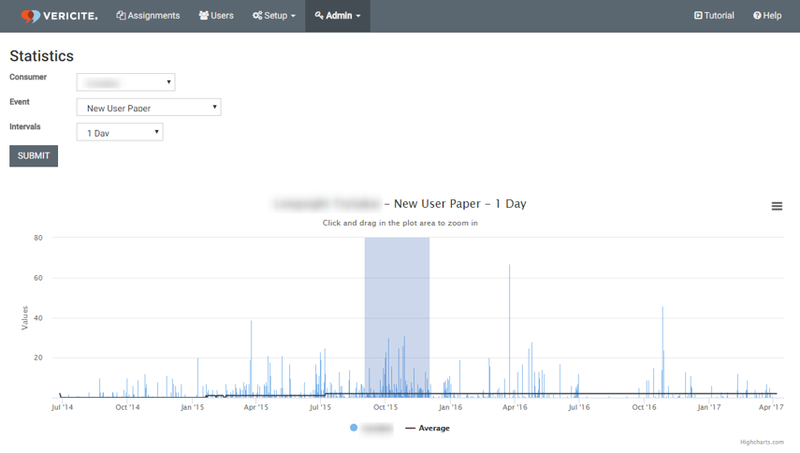 Active Users in last 30 days: Once a day, the number active users in the past 30 days are calculated and recorded. Active Users in last 365 days: Once a day, the number of active users within the past 365 days is calculated and recorded. 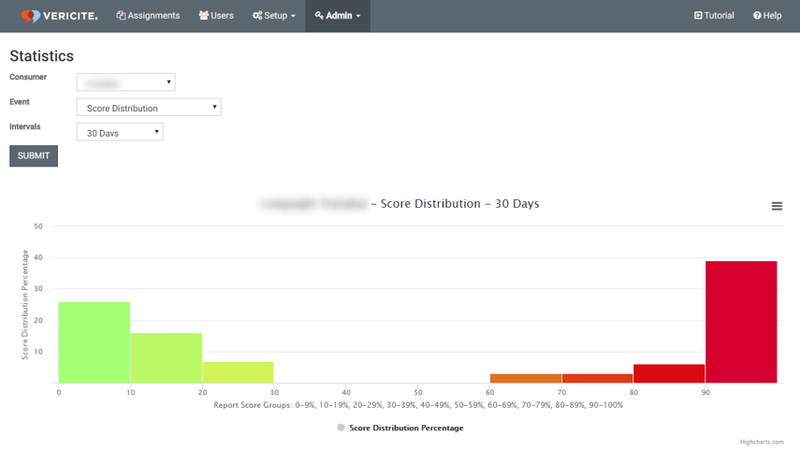 Average Report Score: The average report score for all reports in your instance shown in the intervals selected - 5 minutes, 1 hour, or 1 day. Comments and Annotations: When an instructor or TA adds or modifies a paper comment or annotation. New Assignment: A new assignment has been created in VeriCite. New Course: A new course has been added to VeriCite. New User: A new user has been added to VeriCite. 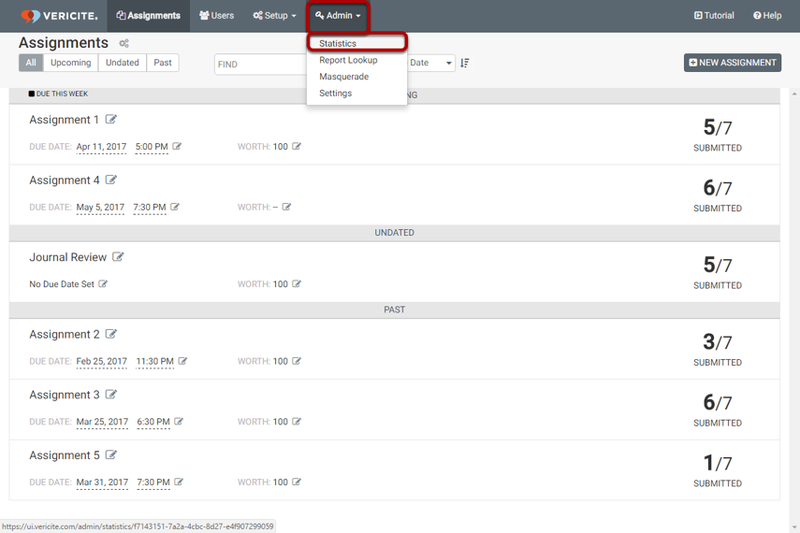 New User Context: A user has been added to a course roster. Paper Scored: A Vericite similarity score has been recorded for the first time or updated. Score Distribution: VeriCite report scores are broken up and tallied in 10 percent increments. You can choose the following date spans: past 30 days, 90 days, 180 days, and 1 year. View Report - All: The number of reports viewed by any user. 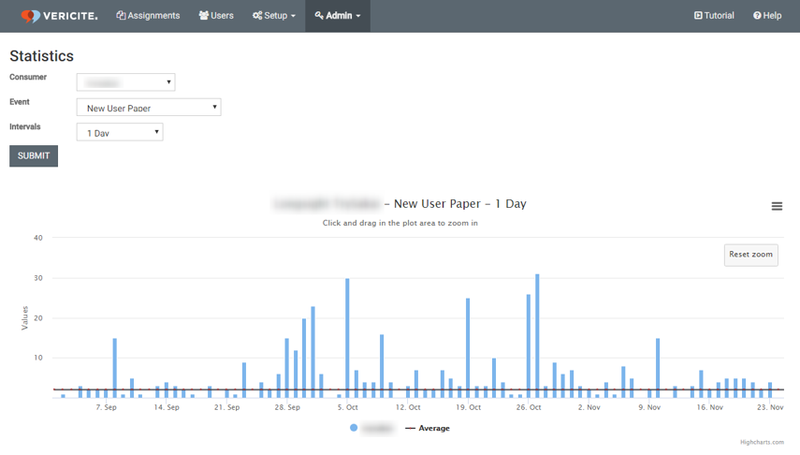 View Report - Student: The number of reports viewed by students. View Report Match: The number of matching sentences inspected in a report by any user. Zoom: Choose the desired Intervals. Zoom: The statistics will display. (Optional) Click and drag over a section of any graph in order to zoom in. Zoom: (Optional) Click and drag over a section of any graph in order to zoom in. The chart will zoom in to show the selected region. Zoom: The chart will zoom in to show the selected region. (Optional) Click Download All Statistics to save the data to your computer as a CSV file. Next: How do I look up a report as an admin?